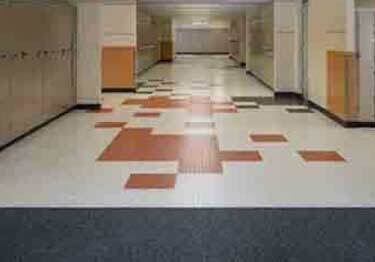 Our ColorSpec by Mannington commercial floor tiles are made with a better rubber formulation. Shaped by Mannington to hold their amazing color, resist indentations and cracking, and be quiet underfoot. Profile patterns that are both practical and lovely make them easy to clean, and ensure that they remain slip resistant for years. Box 20 contains 45.625 Sq. Ft.
No wax require low maintenance option - Self waxing feature for superior appearance retention - Lower life cycle costs. Practical, eye-catching and recyclable, these floor tiles do the job of remaining slip, indent and crack resistant while still obtaining an "easy to clean" title.